Today’s figure is from the Reaper Bones line, a Tiik Warrior. It only has natural weapons and armor, has an eyestalk like a deep sea anglerfish. 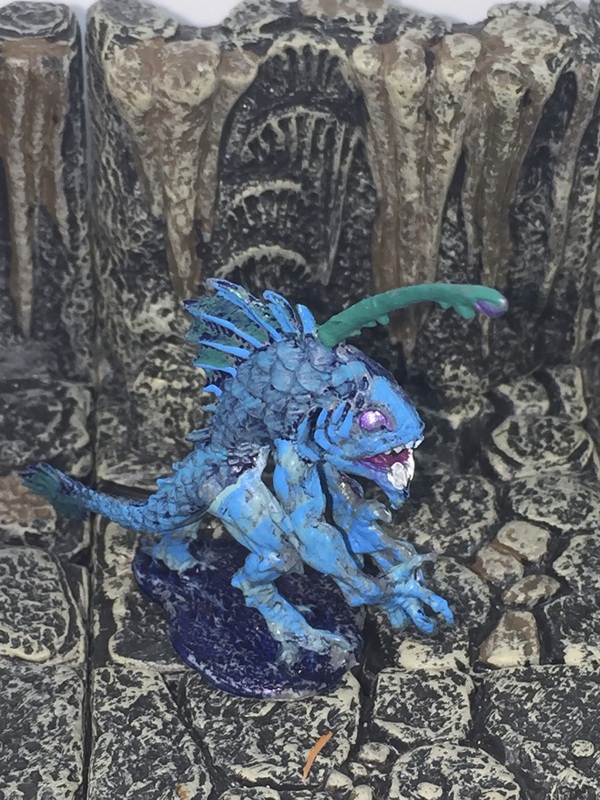 I like painting aquatic figures because of my water-world Aquatica Homebrew. The Tiik Warrior was painted in varying shades of blue and green for camouflage in the deep. My only problem with this figure is that the Bones Reaper plastic miniatures don’t hold all paints well, so you have to put on multiple coats. Check out this previous post for creature stats that I found. Kuo-toa and Locathah are the closest races that I could find to fit their look. Of course this one includes the eyestalk of the deep-sea anglerfish. I also have posts of similar figures to the Tiik Warrior and relations. If you like this post, please consider donating.